this product is a #yay for me because this product helped me so much in brightening. i used to have a dull skin due to a lazy double cleansing, and i can feel my face getting brighter after using this. this is my first serum ever and i am so happy because this serum matched with my skin type. i used it once during the night! #YAY! This serum basically is a combination of oil and water, so when you wanna apply it, you have to shake it first so that the products distribute equally. I love how this is very lightweight ok the skin, eventhough it's an oil product, but it doesn't feel oily on the skin. The scent also very nice, it has citrusy scent. What I amazed about this product is it definitely helps in my pores appearance. I can definitely tell that my pores becomes less visible and this serum also helps in oil production of my skin. 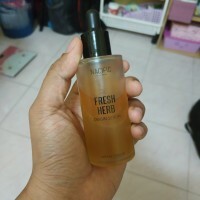 I definitely love this serum as my daily PM routine. Only that I honestly feel this serum is not really suits my AM routine as I'm always in rush. This serum needs you to wait it patiently till it's absorbed. My current favourite that I've purchased this twice! It does a great job in helping me get rid of tiny little bumps (in Indonesia we called it as 'bruntusan'), and help to reduce redness because of acne. Makes my skin look more radiant and glowing, aaaannnd when I touch my face it feels so supple that I love it so much so it's a #yay for me. #Nay because it doesnt give any impact to my skin at all. most of reviews said,the serum works on their skin if the tingling sensation was appeared and after that the skin condition will improved. And it turns out only in my imagination. My skin still in the same state after emptying one bottle of this. #nay, it's works at very first but does not give a very wonderful results like the first try. It came with two textures, oily and water like. You have to shake it before applying it, the scent is strong like citrus. I personally don't like the texture because it's oily. It works wonder at the first week, my skin is brighten but it doesn't any effects after a long-wear routine.